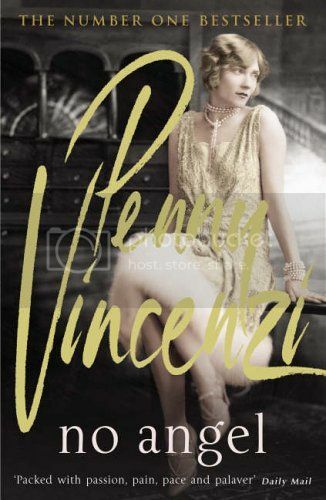 No Angel, by Penny Vincenzi, tells the story of the Lytton family from the early 20th century up to the 1920s. At the centre of the story is Celia, wife of Oliver, who works hard to get what she wants. She wants to marry Oliver, so she gets pregnant to force her parents' hands; she wants to work with her husband at the family publishing firm, and she eventually proves herself to be an valuable asset. I read No Angel because I'm currently in the middle of an A-Z challenge, and I needed to read a V author. I have never read any of Vincenzi's books before, but I could tell I would enjoy this as soon as I picked it up. No Angel is the first in a trilogy called The Spoils of Time, and I've always loved sprawling family sagas, particularly when they take in the two world wars. This is a long book, full of lots of characters, and at times it took me a minute or two to remember who some of the minor characters were! Celia is obviously at the centre of the plot; we get to hear the thoughts of other characters from time to time, but this is really Celia's story. She battles to marry the man she considers (at the age of 18) to be the love her life. At a time when women were expected to marry, stay at home and bring up children, Celia decides that she would much rather have a career, and manages to secure a senior position at her husband family publishing firm. I liked the character of Celia a lot; even when she makes some questionable decisions, it is easy to see why she is making them. Her life, along with everyone else who lived through the atrocities, is irrevocably changed by World War I. My one major criticism of the novel is that I feel sometimes it over relies on the in-the-nick-of-time plot device. At various points throughout the book, just when something is about to happen that will cause a huge disaster, something else happens to avert the danger. Of course, it is an effective way to build tension, but after the third or fourth time of it happening in one book, you begin to slightly tire of it. I'd also say that I think the book is probably slightly too long, at over 700 pages. In the final third, I felt as though everything was being dragged out to ensure a last minute, tension-filled denouement, and I think the book suffered as a result. Having said that, I did enjoy reading it, and I know I'll be looking out for the other two instalments to read. No Angel is soap opera style entertainment, with love affairs, death, betrayal and celebration throughout. If you enjoy that sort of thing and can stomach 700+ pages, you'll definitely enjoy it! * This review also appears on Goodreads. Always looking for a good book :) This seems like my cup of tea, thanks!